Did George H. W. Bush Really Say Atheists Shouldn’t Be Considered Citizens? It’s a damning statement from a man who was serving as Vice President at the time… but there’s reason to doubt he ever said it. The main one is fairly straight-forward: The only person who claims he said it was Rob Sherman, an activist who was writing an article about Bush for American Atheists magazine. … Except that’s not true. Bush officially announced that he would run for president on October 12, 1987… more than a month after the press conference in question. I suppose that exchange is plausible, but it shouldn’t have been hard to confirm. It was a public press conference, not some private meeting. There were other reporters there. There must have been audio and video, right? It shouldn’t have been difficult to find some corroboration. And yet no other reporter ever confirmed the story, and no recording of the exchange ever came to light. So a nationally known activist alleged that a prominent Republican had slandered atheists in public… and we just had to take his word for it. You can see why this was all very dubious. I had nothing but my spotless reputation to go on, but that’s not enough for many who don’t know me. Being that I was a print journalist, I had no need for a tape. All I needed to do was to take accurate notes and report the story in writing. A related question that comes up is: What about the tapes made by all the television and radio stations? Why can’t I get it from them? The answer is that broadcasters save only that portion of their tapes that are broadcast over the air. After that, tapes are erased and re-used. Maybe all of that is true. Maybe it makes sense that in 1987, a politician trashed atheists right in the open and no one else seemed to care. But it boils down to whether you want to take the word of a guy who had a very clear interest in getting a sound bite like this. The statement got even more attention in 2006 when Richard Dawkins shared the anecdote in The God Delusion. Suddenly, people began demanding that Sherman produce some kind of proof that any of this ever happened. Sherman thought he had one other option. 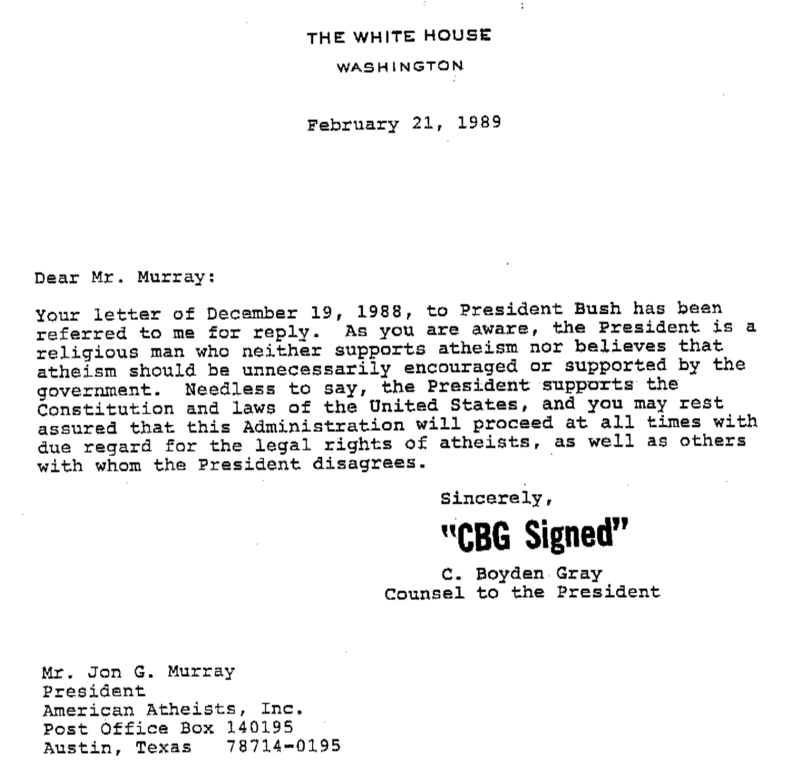 He filed a record request with the Bush Presidential Library in Texas and ultimately found what he was looking for: An exchange between Jon Garth Murray (a son of American Atheists founder Madalyn Murray O’Hair and the guy who was running the group at the time) and then-White House Counsel C. Boyden Gray. After Sherman’s article was published, leaders of American Atheists expressed frustration with the comments in a letter to Bush. The White House’s response, Sherman believed, was a smoking gun. 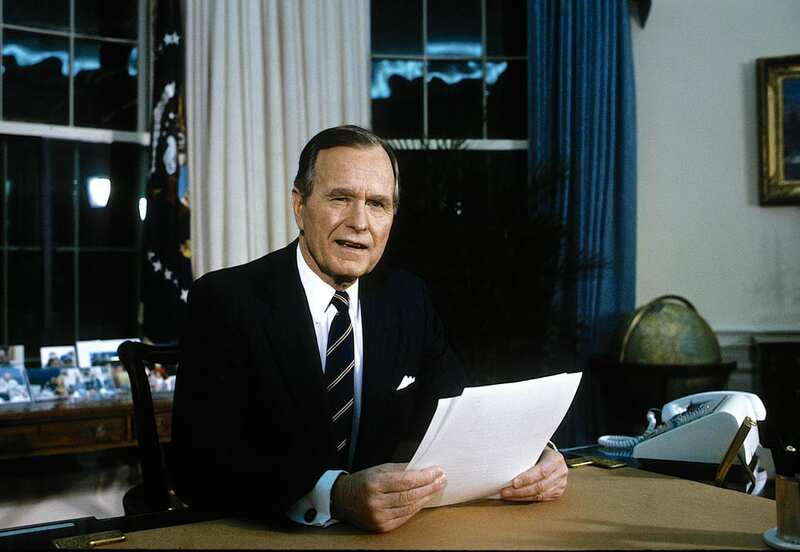 Your letter of December 19, 1988, to President Bush has been referred to me for reply. As you are aware, the President is a religious man who neither supports atheism nor believes that atheism should be unnecessarily encouraged or supported by the government. Needless to say, the President supports the Constitution and laws of the United States, and you may rest assured that this Administration will proceed at all times with due regard for the legal rights of atheists, as will as others with whom the President disagrees. That’s not exactly confirmation of what Bush said… yet Sherman said it was because Gray didn’t deny the statement about atheists not being citizens or patriotic. If [Gray’s] client, Mr. Bush, had not made those statements to me, Mr. Gray would have denied that they were said rather than trying to justify the statements. If Mr. Bush wanted to distance himself from the statements, Mr. Gray could have tried to create doubt about whether Mr. Bush had made the statements. Here, Mr. Gray makes it clear that Mr. Bush acknowledges making the statements reported above. That’s all the proof we have of Bush’s supposed statement. The quotation has lived on for decades even though there’s plenty of reason to doubt it. Bush, as far as I know, never made any (other) public statements against atheism even though Sherman’s story makes it sound like he had no trouble expressing his feelings about the topic that one time. Sherman himself died in a solo plane crash in 2016. His website is offline, too, except for versions that live on in the Internet Archive. I had other conversations with Sherman after my first run-in with him, and he never strayed from his version of this story. 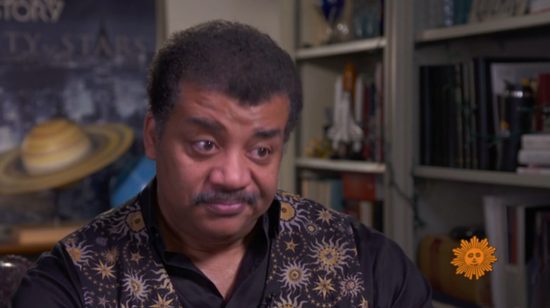 He was also insulted by the idea anyone would question his truthfulness… though I would argue a prominent atheist should’ve known why others might be skeptical of his story. After all, why just take someone’s word for it on a story of consequence? I’m not saying he lied about it, either. What I am saying is that we should all take Bush’s alleged statement with a grain of salt. Anytime the quotation is repeated, it deserves to be written with an asterisk. "I'm going to guess that you have received proper treatment.Me OTOH, I'm totally sane, stable, ..."
"Only when you aint got any. If she had smoked a fatty and listened to ..."